This wartsn’all approach means the noting of the good and bad about the cited groups. This will largely concentrate on the period between circa (= ca.) 500 BCE and ca. 500 CE. By BCE is meant Before Common Era (= BC) and CE indicates Common Era (= AD). Indian seafarers are mainly excluded from this section and will be discussed in Part 2 and onwards. Mention of such as “online in 2015” indicates access in that year. This section figures the people(s) variously known as the First Nations, Native Americans, Amerindians, Amerinds, etc. The latter is plainly an abbreviated form of the term immediately preceding it. The inclusion of the Amerinds may be somewhat unexpected but hopefully the reason for this will become obvious. There has been a considerable amount of research into the maritime history of Amerinds on the Pacific or west-facing littoral of the Americas. Attesting the very long history of seafaring of Amerinds these shores of West-coast Americas is the near-800 pages by Thor Heyerdahl (20). Useful supporting material is in “The Dissemination of American Economic Plants on Precolumbian Sea Routes” by Bruno Wolters (21). Also useful are Richard Callaghan (22), Dorothy Hosler (23), etc. The last three named are among those showing extensive commercial traffic along these Pacific-facing parts of West-coast Americas. Heyerdahl, Wolters, etc, demonstrate this was largely raft-based that again could be non-stop for ca. 3500 miles between Ecuador and west Mexico. A major difference between that of the Indo-Malay ANs on the Indian Ocean and that of West-coast Americas is that the Amerind seacraft had clearly defined steering and propulsion modes. The propulsion came by use of sails and the steering methods were based on devices called guares/guaras, swords/daggers, leeboards, etc. Evidence of the passages between Ecuador to west Mexico include shaft-graves, clothing, language, ceramics (& associated technology), metallurgy (& associated metallurgy), terraced agriculture, etc. Useful agricultural produce was also exchanged according to Wolters (ib. ), as were psychoactive plants plus fungi according to such as Terry McGuire (24). Hosler (ib.) points to the interesting case of the bird called the white-faced jay. She says Ecuadorian habitat differs from that of Ecuador where it has a very restricted distribution in Mexico and says there are no known intermediate stages between Ecuador and west Mexico. She thought that it was attractive to the traders because of its color and its ability at mimicry. The Ecuadorian merchants not only brought these birds to west Mexico but came looking for supplies of the Spondylus shell plus the psychoactive drugs also known in the homeland and apparently having the effects. McGuire (ib.) also refers to an overland trade also reaching east Mexican parts of North America. Looming large among the ancient cultures here are the Olmecs. The Olmec Culture may have had their heartland in the Veracruz province (Mexico). An alternative name for them according to Philip Arnold (25) was Uixtotin (= Peoples of the Saltwater/Sea). To this is to be added Giancarlo Sette (26). Sette (ib.) shows Olmec artifacts evidently traded for gold and jade from Panama/Costa Rica. They include an Olmec-made object found in Costa Rica having decoration matched at the Early Olmec site of La Venta (Mex.) so presumably indicates the beginnings of this trade. What Hosler (ib.) says about the white-faced jay probably showing non-stop traders for ca. 3500 miles applies equally to Veracruz-to- Panama voyages. By far the most complete research into the seafaring of East-coast Amerinds is by Jack Forbes (27 & 28) and is probably the nearest there is to Heyerdahl’s (ib.) massive book touched on already. He regards it as probable that East-coast Amerinds from those of Mesoamerica to those of North America as capable reaching parts of Europe. Forbes (ib.) cites John Heaviside (29) as an early believer of Amerinds reaching that part of Africa known as Egypt. In this opinion, Heaviside runs opposite to the rather later one of Stephen Compton (30) but both agree on the Egypto/Mexican connections (as do many others). Forbes (ib.) refers to many instances of Amerinds possibly known in ancient Europe Also to the finding of bodies with faces that were neither African nor European in vessels washed up in the Azores. This was evidently reported by the brother-in-law of Columbus. Gordon Kennedy (31) makes a further possible linkage of Amerinds with the island-groups collectively known as the Macaronesian Islands that are otherwise the Azores, Madeira, the Canaries plus the Cape Verde Islands. Kennedy is manly describing the Canary Islands. Heaviside refers to half-black and half-white populations in west African oral-lore. He says this is mirrored by a passage in the Popol Vuh (= Counsel-book [of the Quiche Maya]), itself oft-said to be the nearest thing to an Amerind sacred book. More on this comes with the frequent comparisons of west African faces and some those carved on the Olmec Great Heads, the head of a young Yoruba (Nigeria) woman and another in the famous Wuthenau collection, of the names of Yemoja/Yemoya ( a Yoruban sea-goddess) and Yemoye (an Amerind spelling of Jamaica). Other hints added when we read of Roger Blench (32) saying it seems the African palm-oil tree turned into that of the Americas and the American silk-cotton tree became the African silk-cotton tree. A similar pattern of plant exchanges was briefly noted as having been shown by Wolters (ib.) but it should be said that this was mainly a trade in coastal waters. Views earlier than those of Heyerdahl (1952) are cited by Michael Bradley (33) that totally dismisses Amerinds sailing on rafts. Nor do all authorities agree that rafts are a typical seacraft of West –coast Amerinds. Even after the exploits of Heyerdahl detailed in his massive 800 pages (& elsewhere) there is an opinion this only shows Norwegians are good sailors not South American Amerinds were/are. The DNA tests demonstrate Heyerdahl’s basic thrust of an Amerind origin for the Polynesians was wrong but should not be taken as indicating the Amerinds of southern West-coast Americas did not venture out on to the Pacific Ocean. Two books by Jack Forbes have been referred to. In them, he makes obvious he has little time for claimed Africans as an ancestral strand of the Olmecs of Mexico or as traders in the Caribbean coeval with Columbus. It should be borne in mind that although Forbes points to an offshoot of the North Equatorial Current west-flowing to the Gulf of Guinea, the voyages there described in Richard Callaghan’s computerised simulations denote that they were of a drift not purposeful nature. Douglas Peck (34) says Amerinds could not get from Yucatan (east Mex.) to Cuba. If wrecks truly imply bad seacraft, the probable Amerind bodies found in the Azores were in a wrecked vessel. Many would disagree with Kennedy (ib.) seeking Amerind links with the Canaries; the more so given there was even very little contact with nearby islands. With the Cape Verde Islands as the last of the Macaronesian groups in mind, any attempt at linking them with Amerinds in west Africa would surely fail on such as Elysee Reclus (34) noting the current between these islands and Senegal halted contacts. This would almost mirror what Peck says about Yucatan to Cuba. Scandinavia or Nordic Europe is the homeland of the variously labelled as Vikings or Norse and it might again be wondered why they are included here. One similarity are scenes on rocks depicting economic activities in parts of Africa and Scandinavia. Those in the latter region include fishing and are detailed in Graham Clark’s (35) “The Development of fishing in prehistoric Europe”. Clark’s many works attest large bones showing adult cod at sites of the Mesolithic (= Middle Stone Age) plus the gathering of stone from the Lofoten Islands for axe-making. The rock-art continues through the Neolithic (= New Stone Age) into the succeeding Bronze and Iron Ages. By the Pre-Roman Iron Age, the Hjortspring/Nydam/Kvalsum/ Gokstad sequence of Nordic ship-building has already begun. It should be borne in mind this is a simplified version of development but serves as rough and ready way to demonstrate stages leading up to the beginning of the Viking period. The ship excavated at Gokstad (Norway) in the 19th c. is held to be a fine example of Nordic/Viking shipbuilding. As the Phoenicians had a round-shaped merchantmen called the golah so the Vikings had one called the knarr. Likewise, the Phoenicians had a called a kirkarah and the Vikings had the drakarr (= dragon-ship/longship). As is normal, the drakarr as a warship gets most attention. Follow up: Part 1.3: . Stay tuned. Probably the most thorough research into theorised voyages across the enormous Pacific Ocean are by the authors summarised in the two volumes edited by John Sorenson and Martin Raish (1). Several of them firmly opine ancient Chinese knew the Americas as the White Coast, Fusan/Fusang, Mulanpi, etc, and are the ancestors of the Olmecs. The Olmecs are a culture of what variously are called the Native Americans, American Indians, Amerinds, etc, and many of who have the so-called Chinese eye-fold. The Chinese (Fu)san resembles at least one of the umpteen names applied to the Africans severally called San, Khwe, Aka/Akka among numerous others. It seems they seemingly once occupied most of Africa but are now mainly confined to its least desirable corners (esp. the southwest). Their small stature, yellowish skins, epicanthis, etc, made the San/Khwe ideal candidates for speculation about antecedents. The first Dutch in southern Europe happily filled the gaps according to Tia Mysoa (2) when attributing these antecedents to the crew of a wrecked Chinese ship and this will be seen to have other parallels. It will be obvious it is the variously tagged epicanthic, Mongolian, Chinese or Mandelan fold of the eye takes most attention in the attribution to Chinese sources when it occurs in Africa. Tests by Chinese scientists on the DNA hair of the population of the Lamu-group island of Pate and a local women was identified as a “China girl” and there is a one-time naval supremacy of China to which to this is then attached. Porcelain of Chinese manufacture has several Kenyan find-spots and the Chinese placename of Shanghai and that of Shanga (Pate, Kenya) have also been compared. A recent popular about the Chinese in Pre-Colonial Africa is the book simply titled 1421 by Gavin Menzies (3). He described the Treasure ships that the Ming Shi-li (= Ming Records) says were enormous and were led across the Indian Ocean Region (= IOR) by the Chinese admiral Zheng-he/Cheng-ho. Menzies (ib.) further tells us about the Chinese ships having passed Cape Agulhas and on to points west. The significance about Cape Agulhas is that it is the southernmost point of continental Africa not Cape Town as so often said. To its east is the IOR and to its west is the Atlantic. According to Menzies, the Chinese were led by Zheng-he past Cape Agulhas, much of Atlantic-west Africa up to the Gulf of Guinea. Zheng-he is also said to have sailed past Gulf-facing Africa to as far north in west Africa as the Cape Verde Islands. Here they left an inscription marking this great feat at Janela. The South China Sea has been the scene of some spectacular wrecks of Chinese ships according to Arab chronicles cited by James Hornell (4). The Chinese legend of Hsu-Fu tells of 3000 Chinese supposedly migrating across the Pacific Ocean. If their ships are exampled by the replica also named as Hsu-Fu, it fell apart several hundred miles short of its intended American destination according to Tim Severin (5). The Tek Sing was another wooden Chinese ship. It was en route to Indonesia and foundered on an Indonesian island. The loss of life was so great that the Tek Sing has acquired the clearly unwanted label of the eastern Titanic according to a Wikipedia (6) contribution. This is despite the expected Chinese knowledge over the centuries of the routes to and from the South China Sea. On the other hand, that the Chinese fleet led by Zheng-he did get to and crossed the Indian Ocean Region (= IOR) is beyond question. However, the size of his ships has been questioned very seriously by Zheng-Ming (7) and Stephen Davis (8) in China and outside of China respectively. Even a massive timber found in a Chinese frequently claimed as proving the giant size of the Chinese ships turns out to belong to a river-craft not a seacraft. Probably the most authentic giant wooden ships are the Orlando class of battleships constructed for the British Royal Navy that another Wikipedia entry. Their very length made them so unstable and needing steel supports that they proved useless and were soon scrapped. It will be shown this is not the only example of ancient ships of giant size to which this applies. Geoff Wade (9) closely examined the supposedly peaceful and benign nature of Zheng-he’s expeditions and concluded it was anything but on both counts. The epicanthic fold is known all over Africa and owes nothing to shipwrecked Chinese. The more so given that the San represent probably the oldest known strand of mankind. As to the “China girl” from the Kenyan island of Pate, Geoffrey York (10) reports that her brother apparently from the same set of parents and all being black Africans is totally baffled as to her synodontism claimed by Chinese scientists. This will indicate the “China girl” that York (ib.) says was said by Chinese sources as marking a one-time Chinese maritime supremacy does nothing of the kind as to proving this was ever the case. This resembles something on another small island a little to the north of Pate to be mentioned in the next section. The porcelain plus other small finds of Chinese origin occurring in Kenya are likely to indicate general trade with east Africa. The Shangai/ Shanga equation actually proves to have no more substance to it than that of the comparison of Shiraz (Persia/Iran) and the Shirazi (= Swahili) of east Africa. The more so given that Felix Chami (11) has effectively removed this line of argument. York (ib.) further shows that despite the claimed Chinese wreck and despite diligent searches by the Chinese, so far actual wrecks are unproven. There is thus little support for the Chinese claims. Moreover, if Zheng-he’s ships got past Cape Agulhas and sailed along the west African coast, it is surely legitimate to wonder why such a feat was marked in the Janela (Cape Verde Islands) inscription in an obscure Indian language. Follow up: Part 1.2: Indonesia. Stay tuned. MessageToEagle.com – One of the most intriguing ancient documents representing Sumerian literature is the Sumerian King List, produced at the end of the third millennium BC (most probably during the reign of the third dynasty of Ur). According to Zecharia Sitchin, the Sumerian King List describes the first settlements of the Anunnaki on Earth and lists the kingships of the first Anunnaki leaders before the Deluge. The list is an important chronographic document from ancient Mesopotamia that records the sequence of the leaders and the lengths of their reigns. The first considerable fragment of the Sumerian King List was published in 1906. It was found in the temple library of Nippur at the turn of the century. Since that date, more than 15 different fragments and at least one fairly complete list have been found and published. Sumerian King Etana riding the eagle – Akkadian seal. Most of these manuscripts have been dated to the 1st dynasty of Babylon. All the documents show extensive and detailed agreement among themselves. Thus it appears that the extant texts ultimately descend from a common original, i.e., that they are copies, or even copies of copies, of a single original document. The initial section deals with eight kings who reigned before the Flood and is significantly different from the rest. Two main versions exist, the surviving tablets being known as Weld-Blundell (W-B) 62 and 144 respectively, and both are thought to have been originally compiled around the start of the second millennium BC. …..There is also a third version, a much later compilation by Berossus from the third century BC. Not only do these lists contain a record of all the post-flood kings of ancient Mesopotamia through to the time of their compilation, but, at the beginning, we once again find a list of antediluvian kings-and this time their total period of kingship does appear to stretch way back into antiquity. The Sumerian King List has different versions represented by a number of only fragmentary cuneiform sources that are dated to the Ur III period (ca. 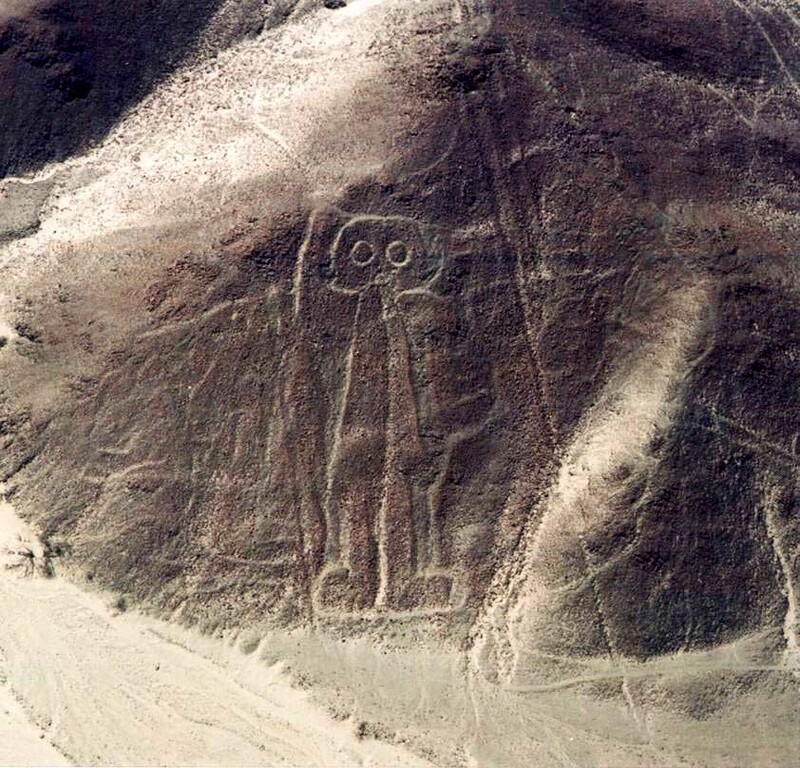 2119-2004 B.C.) and Old Babylonian period (ca. 2000-1600 B.C.). These sources were discovered at different quarters of ancient Mesopotamia and its periphery, including Nippur, Isin, Kish, Larsa, and Susa. With the following look at the goddess Amentet and at Amenty, the Land of the West of the Egyptians, we’ll try to find out whether the Egyptians eventually referred to Atlantis and if so, where they located it. Amentet (Ament, Amentit, Imentet, Imentit) was the Egyptian goddess and friend of the dead, and the personification of the Land of the West, Amenty – imnty. It was she who welcomed the deceased to their new dwelling place in the netherworld. She was also a goddess who helped with the rebirthing process, and thus a goddess of fertility and rebirth, who regenerated the deceased with food. According to scholars, the word ‘Amentet’, as used by the Egyptians, was applied to the west bank of the Nile – Egyptian cemeteries and funerary places were all on the west. To the Egyptians, west was a direction linked to death. Amentet was also the name of the underworld – the place where Ra travelled during the night. The place where the sun set was also called by this name, being the entrance to the land of the dead according to Egyptian belief. Amentet – ‘She of the West’ – was therefore the goddess of not only the land of the dead, but also of the entry to the underworld, and of the west itself. (Source: Caroline Seawright). So, Amentet was a “western region”, a district from the homeland. In Egyptian writings, Amentet is referred to as the world of the deceased as well as a lost western homeland. This would be a logical way of remembering a sunken continent in the West that maybe constituted the very base of the Egyptian culture itself. In this context it is also interesting to remember that the Egyptian historian Manetho mentioned that the ancient god kings reigned in a foreign land (also see: Manetho’s king list). The hieroglyphs of set (“foreign land”, or a mountain land, or the world of the deceased, the Underworld) and Amentet are very similar to each other: set looks like a base with three waves, while Amentet looks the same with two dots or half circles over two of the waves. Amentet can mean West, Land of the West or Underworld. Was the mythical Amentet a legend that changed over time, based on the existence of a landmass that had sunken into the ocean a long time before? If Atlantis was in the West, and, as Plato states, “beyond the Pillars of Hercules” which was the phrase that was applied in Antiquity to the promontories that flank the entrance to the Strait of Gibraltar – then maybe we have a hint to where Atlantis actually laid: in the ocean today called the Atlantic Ocean, like many people think. This might explain the similarities between the Egyptian and the South- and Mesoamerican cultures: if a landmass, big enough to be called a continent, sank into the Atlantic Ocean, survivors might eventually have arrived on the shores of Western Europe and Africa, as well as on the Eastern coasts of the Americas. We’ll leave the Americas for later to find out more about the connection between the red-haired people and Atlantis. At this point, it makes sense to have an excursion to ancient Greece before passing on to the American continent, and focus on Amentet’s Greek counterpart: the Isles of the Blessed Hesiod. In the time of the Greek oral poet Hesiod, Elysium would also be known as the Fortunate Isles or the Isles (or Islands) of the Blessed, located in the western ocean at the end of the earth. Again, here we encounter the idea of a land in the West, consisting of several isles, like in the description of Amentet. The Isles of the Blessed would be reduced to a single island by the Thebean poet Pindar, describing it as having shady parks, with residents indulging their athletic and musical pastimes. 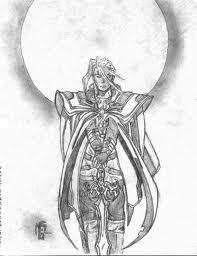 The ruler of Elysium according to Pindar and Hesiod was Cronus but varies from author to author. What seems really striking in this context after everything that has already been said is the fact that Homer mentions Rhadamanthus as the ruler of Atlantis. In Homer’s description, Radhamanthus was a redhead – or at least, it’s pointed out that he was fair-haired. 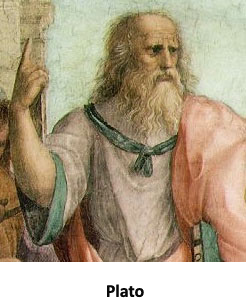 Almost everything we heard about Atlantis, was said by Greek philosopher Plato. According to Plato, the original kings of Atlantis were the ten sons of Poseidon and Cleito. Allegedly, Cleito gave birth five times to a couple of male twins. The first born was Atlas who ruled over all others. The fact that Cleito should have given birth to just ten males and no female child seemed so incredible to many researchers that this fact is part of Atlantis being considered a result of Plato’s fantasy. However, not only was the number 10 a very important factor in the rise and fall of Atlantis, but the number 10 for itself and as the number of kingdoms of Atlantis is perpetual in all ancient traditions. Egyptian historian and priest Manetho called the first sequence of Egyptian god-kings ‘Auriteans’. So, the idea emerges that Manetho’s god-kings are the same rulers as Plato’s kings of Atlantis. R. Cedric Leonard is convinced that Manetho’s list of Egyptian god-kings is in fact a list of the first kings of Atlantis and expands on this idea on his website. Is it possible that it’s a mere coincidence that a tale of a world distant in time and place, consisting of 10 kingdoms, is present in so many ancient texts all over the planet? Storytelling over thousands of years may have changed the details, but it seems likely that there’s a common root – maybe the story of a doomed continent or isle the survivors of which reached the coasts of other, still less developed cultures, influencing the evolution of those peoples. Some very interesting pieces of this puzzle can be found on the other side of the Atlantic Ocean: the Americas. 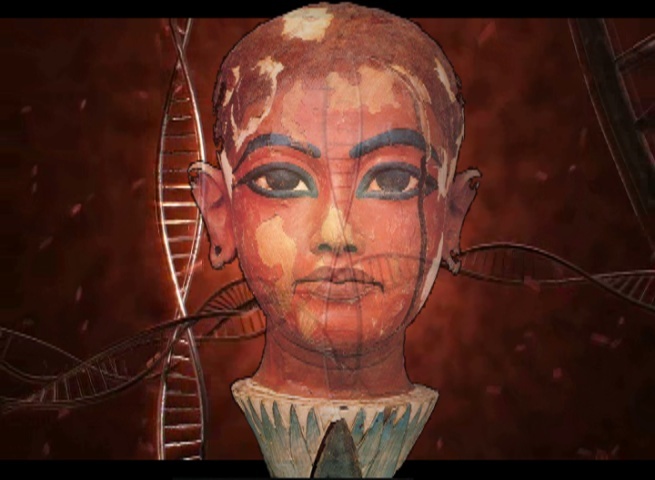 In 2011, the Swiss laboratory iGENETA reconstructed the DNA of the mummy of Tutankhamun. They discovered that more than half of the European population shares a common ancestor with the Egyptian child pharaoh. The genetic profile of Tutankhamun belongs to the haplogroup R1b1a2. Haplogroup R1b (Y-DNA) is the dominant paternal lineage of Western Europe, with especially high incidence in Spain, Portugal, Western France and Ireland and in parts of sub-Saharan Central Africa (for example around Chad and Cameroon). R1b is also present at lower frequencies throughout Eastern Europe, Western Asia, Central Asia, and parts of North Africa, South Asia, and Siberia. 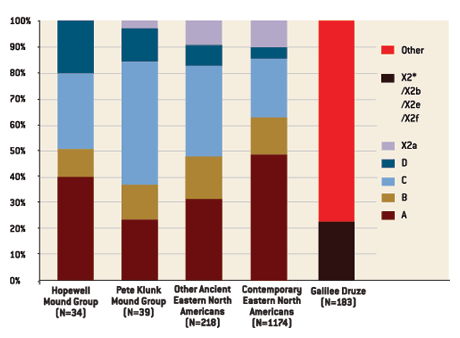 Today, in Egypt this haplogroup is found only in 1.1 per cent of the modern population, explains Roman Scholz who conducted the tests of iGENETA. For the scientists, there were many different possibilities of which DNA groups could have been found. R1b1a2 is being found in 70 per cent of modern Spanish and 60 per cent of modern French men, therefore the scientists think that the first ancestor lived in the Caucasus around 9,500 years ago and shifted towards South and West during the first migration period in 7000 BC. Tutankhamun was the son of Akhenaten (formerly Amenhotep IV) and one of Akhenaten’s sisters, or perhaps one of his cousins As a prince he was known as Tutankhate. He ascended to the throne in 1333 BC, at the age of nine or ten, taking the throne name Nebkheperur. His wet-nurse was a woman called Maia, known from her tomb at Saqqara. In 2008, it turned out that Tutankhamun’s parents were brother and sister: a team of researchers investigated the DNA research of Tutankhamun and the mummified remains of other members of his family. The results from the DNA samples finally put to rest questions about Tutankhamun’s lineage, proving that his father was Akhenaten, but that his mother was not one of Akhenaten’s known wives. His mother was one of his father’s five sisters, although it is not known which one. The team was able to establish with a probability of better than 99.99 percent that Amenhotep III was the father of the individual in KV55, who was in turn the father of Tutankhamun. The young king’s mother was found through the DNA testing of a mummy designated as ‘The Younger Lady’ (KV35YL), which was found lying beside Queen Tiye in the alcove of KV35. Her DNA proved that, like his father, she was a child of Amenhotep III and Tiye; thus, Tutankhamun’s parents were brother and sister. Queen Tiye (Tia, Tyre) had blonde or red hair. Is there anything about redheads in ancient Egypt that has been documented? Queen Hetop-Heres II, of the Fourth Dynasty, the daughter of Cheops, the builder of the great pyramid, is shown in the colored bas reliefs of her tomb to have been a distinct blonde. Her hair is painted a bright yellow stippled with little red horizontal lines, and her skin is white. Given this information it’s interesting to note that we now know that many pharaohs of ancient Egypt were red-haired, including Ramses II, also known as Ramses the Great. In fact the number of red-haired mummies unearthed seems strikingly disproportionate, especially given the climate in Egypt. However, what is striking about Ramses II, who was the 3rd pharaoh of the 19th Dynasty, is that his father was Seti I. Seti means “the follower of Seth”, who in Egyptian mythology is in fact the god who murdered Osiris. It is documented that red-haired people were known to many of the peoples of the ancient world, but they always constituted a minority in every population. Their appearance in areas like Egypt and Peru surprises us for the climate, but the location in South America surprises us even more for the distance of the alleged source. Plato was certainly not the only one who mentioned the existence of the mythical Atlantis. There’s in fact reason to believe that Plato gathered much of his knowledge as well as the tale of Atlantis from his visits in Egypt. The Egyptians probably mentioned Atlantis in their writings – the writings about the mysterious land “Amentet”, the Land of the West. Sources: Wikipedia, The Myths and History of Red Hair, Burlington News, Science Frontiers. James Frazer: The Golden Bough. England 1890. Many thanks to José Da Silveira. 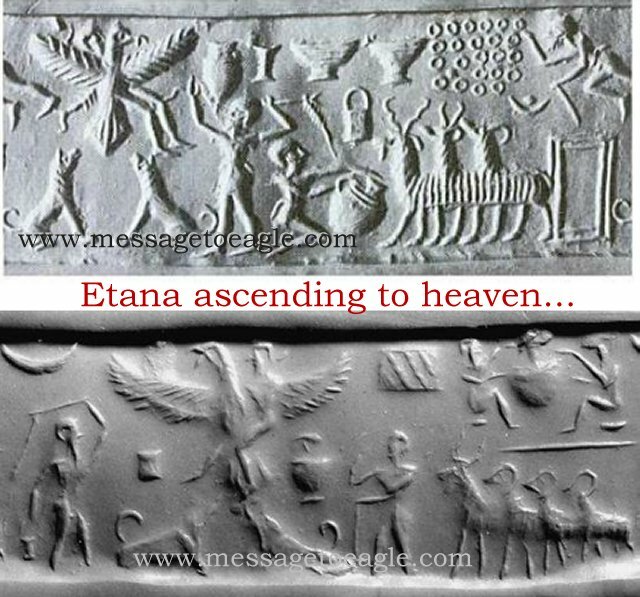 MessageToEagle.com – Did a highly advanced Antediluvian civilization once inhabit Malta, a small island located in the Mediterranean Sea? 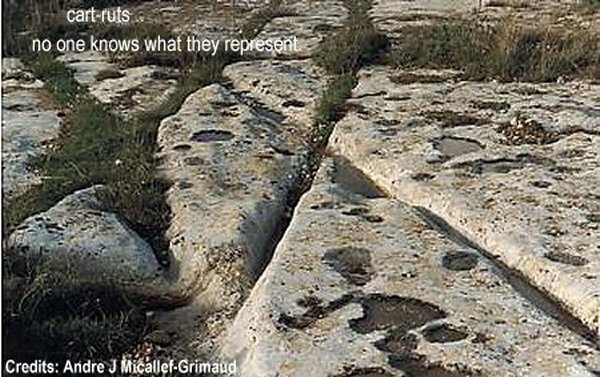 What kind of sophisticated machinery was responsible for the creation of strange ruts carved into the rock which are found in many parts of Malta? In certain places like St Georges Bay and Dingle, they pass across the cliffs and continue directly into the water, which would suggest Malta was once in the distant past part of large continent, namely Atlantis. A number of theories have been put forward in an attempt to shed some light on purpose and function of these enigmatic structures. The features cover many square kilometers but who built them and how? 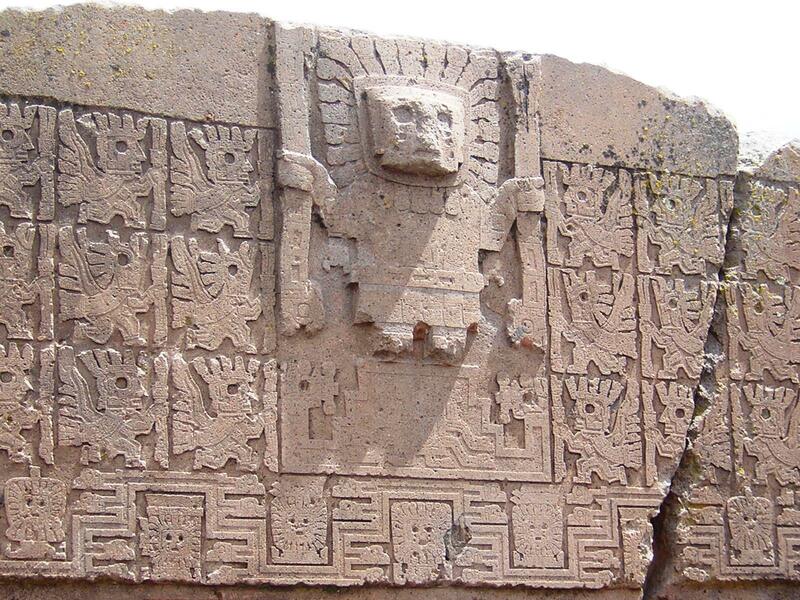 Was it a strong extraterestrial influence involved in their creation? First of all, no one knows what this network of traces represent. 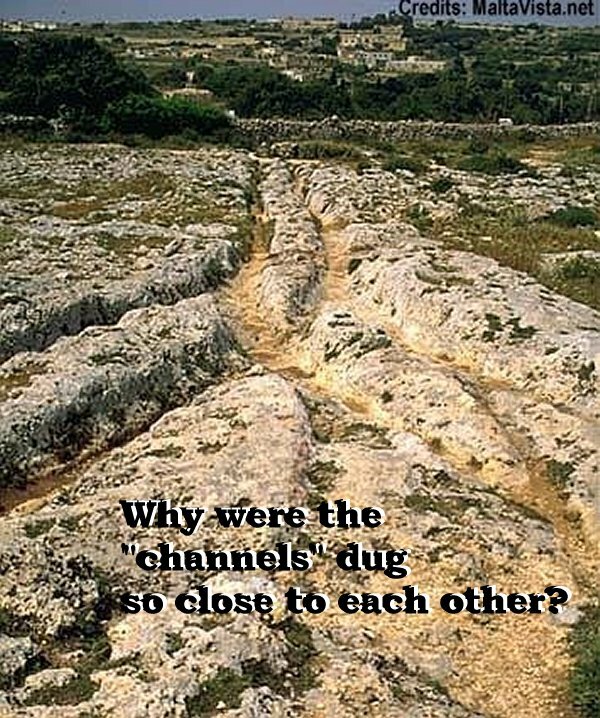 Malta’s cart ruts were considered to be a cult, calendar, aqueduct, writing and other nonsense. Malta’s cart ruts are peculiar. These are not ordinary rails we find on the ground, because the traces of parallel running grooves differ not only between the different tracks, but even in the course of a single track. This is particularly clear in the southwest of Mdina, the old capital of Malta, in the area of Dingle. The cart-ruts are running through the island’s valleys and in other places they can be found on the hills or disappearing in the Mediterranean Sea. They climb the hills, run through valleys, then suddenly narrowed to two-track line and finally fall in a very risky turn. The cart-ruts appear in single pairs or in groups and always perfectly parallel. The approximate depth of these prehistoric “channels” is from 8 to 15 cm. In some places their depth is about 60 cm. The distance between the cart-ruts which form “V” or “U” pattern is often about 1.4 meter but it may vary. Were they left by vehicles and their wheels? No, because this hypothesis does not allow for the different width of the traces. The traces do not always have a uniform depth of what they would do – if they were caused by chariot wheels. However, different depth of grooves could compensate for irregularities in the rocky ground. Why was it necessary to avoid irregularities? In the south-western cliffs of Gnejna Bay, for example, the traces lead up to the cliffs that drop 30 meters perpendicular to the sea. Besides, sometimes ruts turn so sharp and at the same time, are so deep that no vehicle could be able to make such maneuver. Why would someone create a road in such unusual place? These are the precursors to the events which eventually lead to the great floods, that affected the whole planet. The Sumerians left behind legends about the gods and their early settlement as told in the “Barton Tablets”. These according to Christian O’brian “The Genius of the Few”, tell of a land “of the gods” which at one time became frozen and cold, and eventually forced them south. I consider these myths about the Sumerian “gods” to be ancient recollections of very early events remembered for millenniums, that actually happened to the ancestors of the Sumerians, about their old homelands in the frozen land areas like Siberia. They called this place “Karsag”. I believe that this freezing was caused by the shift in the North Pole 13,000 years ago, which plunged Central Siberia from a temperate climate to a polar climate, where the ground a few feet from the surface never thaws out. Scientists have found frozen mammoths in Siberia, whose stomachs were still filled with plants that are known to live only in temperate climates, and not in the arctic regions. Some groups trapped in this new harsh climate after the pole shift were so decimated by the freezing Siberian weather that they probably reverted to a primitive subsistence, which they could never hope to recover from in their new harsh surroundings. The lucky ones further away were able to move and look for new lands in more favorable climate, such as the great southern lakes like the Black Sea, Caspean Sea, Lake Baikal areas. Similar stories are also told by the Californian Indians of the Penuitan language group, who are believed by some linguists to be descendant of the Ob-Ugrians of North Western Siberia, who are a branch of the FinnoUgrian language group. The ancestors of these Penuitan Indians crossed the Berring Straights and traveled here from the north. These Indians also believe that their gods come from and live in the polar regions. Their language has many common words with Ugrian and FinnUgor languages to which Finnish, Hungarian, Estonian, Lappish, Samoyedic, and several other minority languages of Russia belong. The language group is scattered from the Pacific to central and northern Europe. Historic linguists also claim that the ancestors of the early Iranians also lived in close proximity to the Ugrians (Hungarians, Vogul and Ostjak languages), based on some common early words. According to ancient Hungarian legends there was an intermarriage with the Iranic Alan people. It is no surprise then that Iranian myths also talk of the freezing north in ancient times. This is an excerp from the Avesta of the ancient Persians: “…At that time Airyana Vaejo had a pleasant climate, with 7 months of summer and only 5 months of winter. The forests were rich with game and the fields with grains. In the valleys many brooks flowed. This land however turned into a cursed land, where for 10 months it was winter and only 2 months was it summer, following the attacks of Ahra-Majnyu (the evil-devil).” This land could not have been Europe, since prior to the pole shift most of Europe was under ice or very cold, and only afterwards did it warm up. The implications and consequences of a climate change of such magnitude must have had a tremendous effect, causing the decimation of populations in areas plunged into the arctic, due to the dying of plants and animals and the initial loss of food supply. It also caused the subsequent changes in a way of living and the great migrations away from a once hospitable original homeland for those that could still manage to escape. The initial places for this maximum climate change would have been in central Siberia, around 100 degree East longitude but it affected much of the north also. It is believed that the early FinnUgor nations during the Ice Age lived in what today is the Ukraine and as the ice receeded many of them moved north to scandinavia. A branch of them however then started moving east and crossed the northern part of the Ural mountains and spread all around it. Others mingling with the local indegenous people of the north east, such as the Samoyeds and others navigated much of the arctic and crossed into north America. Portions settled in the western states and California and are called the Penuitan language family. Special branches went further south into Yucatan and became the Maya indians. In the early phases these all had sizable ethnic elements which included the original north European caucasian types, not just the later mixed Siberian types. The time after the ice age was fairly warm even in the northern areas from 7300 to 5300BC it was hot and dry. Around 5,500BC another kind of catastrophy occurred. The flooding of the Black Sea . This was the “great flood”, as told by Sumerian legend, which was borrowed by later civilizations of early Mesopotamia and was eventually written down in the Bible. Those who were able to escape this flood fled from this once fertile lowlands, into Eastern Europe but the majority headed toward the warm climate of the south, to Mesopotamia. They founded the first recorded civilization of mankind, whose literature actually survived. Then from 5300 to 3000BC, following the Black Sea flood, it was wet and warm and is known as the W�rm period. After this it started to get continuously cold again in the north. Some groups trapped in this new harsh climate were so decimated by the freezing Siberian weather that they probably reverted to a primitive life style, which they could never hope to recover from in their new harsh surroundings. Searching for Noah’s flood on the bottom of the Black Sea. The flooding of the Black Sea and the Caspean Sea occured around 5,500BC and affected mainly the north shore of the sea. The rising water levels in the Mediterranean and the connected Sea of Marmara next to modern Turkey, caused growing pressure on the earth’s crust in a highly earthquake active region. This may have triggered major earth quakes and perhaps even some volcanic eruptions. This could have weakened or even lowered the earthen barrier between the Sea of Marmara and the Black Sea. Once this wall was breached, a huge waterfall, bigger than 40 Niagara Falls, started filling the much lower Black Sea basin, causing the destruction of the ancient civilization located there. 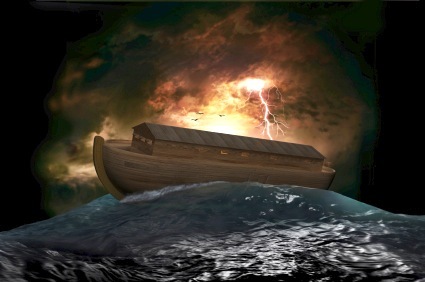 This was the “great flood”, as told by Sumerian legend, which was borrowed by later civilizations of early Mesopotamia and was eventually written down in the Bible. Those who were able to escape this flood fled from this once fertile lowlands, into Eastern Europe but the majority headed toward the warm climate of the southern Mesopotamia. They founded the first civilization of mankind whose literature actually survived and is understood today. The Babylonian version of the flood goes into some detail about the fiery nature of the flood, which shook the ground and blackened the skies, along with the great flooding of the lowlands. MessageToEagle.com – We find a great variety of prehistoric figurines around the world and many of them are very curious in their appearance. 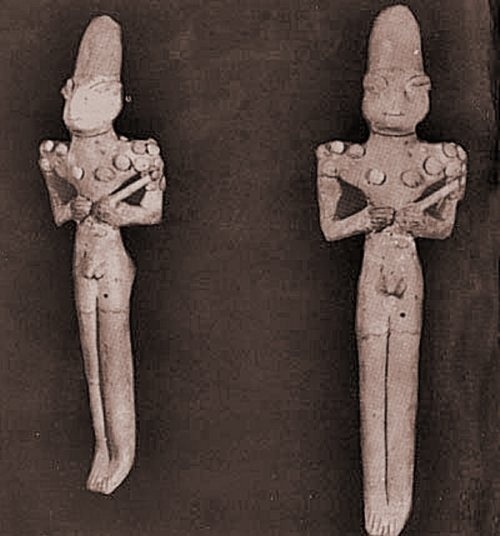 These enigmatic figurines, dated to the so-called Ubaid period in Ur (6000 to 4000 BC) were unearthed by Sir Charles Leonard Woolley (17 April 1880 – 20 February 1960), a British archaeologist best known for his excavations in the 1920s and 1930s in Mesopotamia. The figurines depict snake- or reptilian-headed humanoids that were found in several Ubaid cemeteries in the vicinity of Ur, southern Iraq. Are they the Annunaki of ancient Sumerian legend? Tell (mound) of Ubaid has given its name to the prehistoric Ubaid culture considered to be the earliest settlement on the muddy plain of south Mesopotamia and this culture spread northward up the Tigris-Euphrates during the fifth millennium BC and lasted until the beginning of the Uruk Period. “Each Ubaid figurine has its own unique pose. Most interesting is a figurine depicting a naked female feeding a child having long slanted eyes and the head of a reptile. It suggests that the baby was seen as having been born with these features. 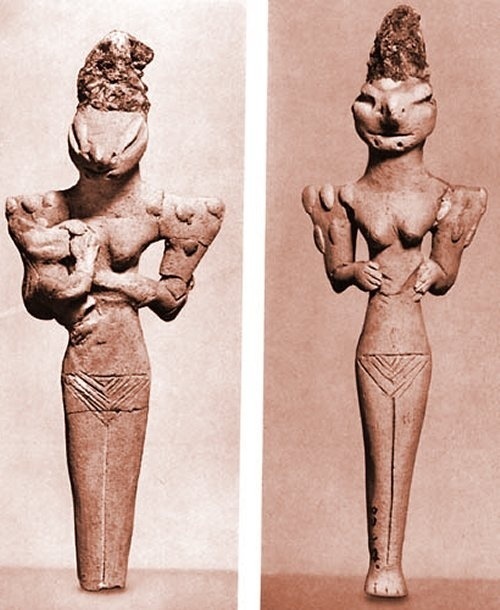 In other words, the `lizard-like’ heads of the figurines are not masks, or symbolic animalistic forms, but abstract images of an actual race believed by the Ubaid people to have possessed such reptilian qualities,” (Andrew Collins, bestselling author). Ubaid alien-looking beings are often linked to myths and legends about ancient spacemen who came to Earth to seed the planet and promised to return one day. Several authors – proponents of ancient astronaut theories – like for example Erich von Däniken and the late Zecharia Sitchin, mention these curiously looking reptilian beings.